Guest Bio: Suzan Damas is a native of Tanzania and has traveled extensively in Africa. Suzan talks about the region, culture, lifestyle, and food in this culturally rich area of the world. She is the author of “Green Banana Cookbook” which is strongly influenced by cuisines from there. The area receives a constant stream of travelers/tourists in addition to health care providers and missionaries. Neal Howard: Hello you’re listening to Health Professional Radio. Thanks so much for listening today, I’m your host Neal Howard. It’s our pleasure to have in studio today with us returning guest Suzan Damas – native of Tanzania. And she’s traveled extensively in Africa and around the world. 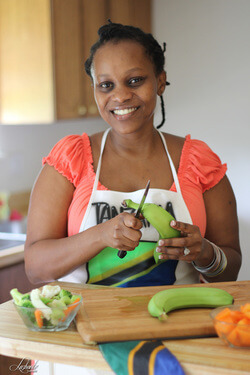 She’s the author of the “Green Banana Cookbook” which is strongly influenced by the cuisine from her native village. And also she talks about the area receiving a constant stream of travelers, tourists and healthcare providers as well as missionaries. So in her homeland there are some health issues that Western culture is trying to address and she’s here today to talk with us a little bit about some of her remedies for certain maladies. How are you doing today Suzan? N: Great. In another segment when you we’re hear with us before, we talked about the lack of some of the diseases that you find in countries other than your native Tanzania. As author of the “Green Banana Cookbook,” I’d like to talk with you a little bit about to some of your home remedies that maybe you didn’t include in the book or you keep them maybe a family or traditional thing that you brought with you from your homeland. When it comes to home remedies, what could you talk about? S: Well I have a couple when it comes to allergies because that has been the main thing. Well with this sniffles and itchy noise and sneezing I do a little bit of ginger. I squeeze the juice out of them put it in the blender or some kind of pre squeeze the juice out of them and put some honey with it and a drop or two of lemon. So that just does it, I don’t take all these allergy medications and pills and stuff – that just does it for me and my kids. And for the times when my kids are really little and they don’t have a say over what I do to help them with their eyes when they’re itchy and things like that, I use breast milk. I know this may sound gross to some people but you can read research on it, breast milk has some elements in it that help your body either reconstitutes itself or whatever it does. But I take some breast milk and put in their eyes and whatever infection is in there, the next morning they wake up with clear eyes. I mean good looking and everything but one day when they get to 9 year old and 8 year old there like “Oh no mommy, that’s gross” but when they’re younger that works as a charm. N: Can you buy it or is there a supply of it or are you talking about your own breast milk? S: Yeah lucky for me, I am. Yes it’s my own I breastfeed my kids until their at least two years or whenever they can say “No.” So lucky for me it has been my own. N: Now would you suggest if someone knows about the properties of breast milk to combat allergies in the eyes? Because my brother up with his eyes crusted over when he was a child or frequently and it would take sometimes 30-40 minutes to in the bathroom to get him cleaned out. Would you suggest saving your breast milk and storing it for such an occasion as your kids become older and they’re not breastfed anymore? Is that something that can be done? S: Unfortunately that cannot be so practical because they say breast milk can stay in the freezer for just so long. S: So eventually the breast milk loses its properties. So that can just be, you might need to look up some more but I want to say it’s up to 6 months in the freezer and maybe 9 months in the freezer. So after that, it’s no good anymore. N: So it goes bad just like any other milk? N: Now, when were talking about your kids and how it was easier for them when they have no say over what you did. And as they get older, they start to see things on TV and hear things from their friends. As far as childhood diseases that you’ve had to deal with, with your kids are there any things that you’ve done for them to make sure or to keep them from having to go to the doctor? S: The main thing has been the green bananas. For example when they’re teething, they get really soft stool and tummy issues and things like that so I go right back to the recipe I told you earlier with green bananas and fresh milk and you put in the blender and you give it to them. I go right back to that, I put a little butter just add taste to it but that has been my go-to because that has been the most issue as far as them being grown and things like that. But other than that, no, I haven’t had to do too much. The magic serum has not been my friend I’m thankful for that, we don’t get sick. N: Now when you were growing up in Tanzania, were there any illnesses that would strike children more or exclusively as opposed to adults? S: Yeah there are some, clearly malaria. And even there waterborne diseases like cholera because kids wouldn’t know, sometimes they’ll just get into a bucket of water and just drink not knowing this is for what. So yeah that’s pretty much it and just childhood fevers and things like that. N: Now some of these fever were talking about, are these fevers that you haven’t seen since living Tanzania? Or have you seen them? S: Yes I have seen them here too. Kids get fever a lot, a lot. There’s a lot of information out there after a certain degree then take the child to the hospital. Below that, just monitor the child, do this, do that. I’ve seen kids get fevers a lot for whatever reasons whether they’re teething or there’s something, they’re fighting. So I think that’s pretty much the same across the board. They also get fevers here. N: Now when we were talking about what is considered to be alternative medicine, the medicine and treatment that is normally not found in traditional western medicine. Would you say that in your experience coming from Marango Village, was there a lot of what we will call alternative medications or do they go to the hospital just like anybody else? N: (chuckles) Yeah, no idea what a medicine cabinet was. S: Yes, Mwarubaini. Yes it’s called mwarubaini. So you boil it and drink its juice and it gives you a lot of that stuff that your body needs to fight it. And this tribe, the Masais – you might have seen them they are notorious for traditional remedies. So we use a lot of that, we do. And we also do pills and drugs and Western type medicine also but not to the same extent and some things don’t even require medicines such as many things that are social. Many people feel blue and depressed and stuff, that’s not so much in our vocabulary because boy the social networking, the social neatness is I mean is just great. It’s really great, you always have somebody to talk to so there’s no … that minimizes heart issues and all this other stuff. N: So with the spread of social networking what you found is a lower instance of mental disease because you say that people have other people to talk to as opposed to several years ago when social networking wasn’t as prevalent as it is now. S: Yes and this does in fact I think been recommended by the American Heart Association they say “Just call somebody, it’s good for your heart.” Call somebody, go see just talk just be network, be connected use a feeling of feeling connected will be good for your heart and everything because that’s another thing I find myself suffering from here. The anxiety because even with raising kids you or our kids everything when you’re out in public, for example I would go to the library and if my kid got into somebody’s purse or somebody’s computer without them wanting – that person would come and get me to go and reprimand my kid. And I’m thinking that is too much time we just wasted. She’s probably got me to do something else, why don’t you just go at it? Why don’t you just tell her that there are things that are universal I agree that kids should not do. If this is one of them just, take the liberty. I mean it literally takes the village to where I come from. S: It literally it takes a village. So that at least keeps your mind at ease, that if I miss it, the neighbor might see, a passer-by might see so all that keeps your mind at ease and I mean you get information that way and they help. N: And in the United States and other Western countries, many of the hospital visits are due to what we call stress related illnesses. So as you’re saying just reaching out to somebody and staying connected can reduce a lot of stress thereby reducing the instance of things like heart disease, anxiety, maybe even obesity and things of that nature, right? N: Yes because people are so now they want to embrace their individuality and save them so much and embrace the depression from being overweight as opposed to if they were social out there, being social they would find the courage, the motivation, they would find somebody who will be like “I feel you. I understand you. I can join in your fight to lose weight.” So it helps, it definitely helps. N: You’ve been listening to Health Professional Radio, I’m your host Neal Howard. We’ve been in studio today with Suzan Damas, she’s a native of the area of below the Mount Kilimanjaro in Tanzania. And she’s also the author of the “Green Banana Cookbook” where she talks about many of the recipe from her native land and talks about the benefits of well just “green bananas” in many, many different recipes. We’ve been here today talking about some of the ways that she saw diseases and other maladies being addressed as a child as opposed to some of the differences that she have seen here in the United States or in other Western countries. We’ve also been talking about how just reaching out to someone and talking to someone about what’s going on in your life reduces the instance of stress, thereby reducing the instance of heart disease and many other ailments that are typically labeled as stress related illnesses. It’s been great having you here with us today Suzan. N: Thank you Neal. Thanks a lot.